↑ Zappa with Occhiogrosso, 1989, The Real Frank Zappa Book, p. 15. 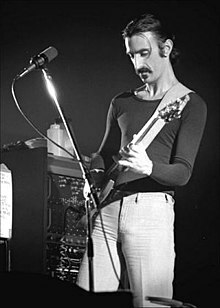 ↑ "Frank Zappa | Biography & History | AllMusic". AllMusic. สืบค้นเมื่อ 2017-08-08. ↑ Whitaker, Sterling (December 4, 2015). "The Day Frank Zappa Died". Ultimate Classic Rock. ↑ Maume, Chris (October 12, 2015). "Gail Zappa: Frank Zappa's wife, muse and manager who ferociously protected his musical legacy". The Independent. ↑ Buckley, Peter (November 17, 2003). The Rough Guide to Rock: [The Definitive Guide to More Than 1200 Artists and Bands] (3rd ed.). London, United Kingdom: Rough Guides. p. 1211. ISBN 978-1-84353-105-0. หน้านี้แก้ไขล่าสุดเมื่อวันที่ 17 กรกฎาคม 2561 เวลา 12:29 น.